Team Ubhejane during training for Expedition Africa 2017. L-R: Dr David Zimmermann, Dan Leeuw, Ben Makoloi and Marilyn Zimmermann. Wilderness Foundation Africa is supporting the SANParks/Team Ubhejane (meaning black rhino in Zulu) to take part in Expedition Africa 2017, a 10 day adventure race taking place in the Baviaanskloof this year. 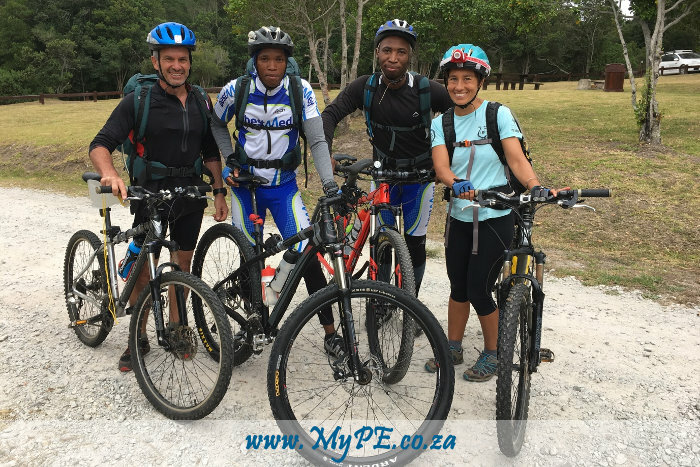 The event covers 500 km, involving a number of disciplines including mountain biking, canoeing, hiking and swimming from 10 – 20 May 2017. While a high degree of fitness is required, the event also demands that participants are able to navigate under challenging conditions during the day and at night. The training, preparation, teamwork and personal growth associated with this and similar events are in line with the desired outcome of fit and motivated field rangers capable of managing protected areas effectively. Matthew Norval, Chief Operations Officer of Wilderness Foundation Africa, explains the rationale behind this sponsorship: “Protected areas are a key strategy to conserving biodiversity. In addition to the protection of entire landscapes and wildlife, they also offer considerable social benefits. There is general agreement that the concept of protected areas does work and that they not only need to be expanded, but that mechanisms need to be put in place to ensure their long term maintenance and effectiveness. This said, the people responsible for the management of these areas have a critical role to play. WFA supports the promotion of staff wellness in general and that of field rangers in particular. Wellness encompasses a wide range of physical and mental factors that enables individuals to remain fit and motivated and in a position to reach their full potential personally and professionally”. Follow Team Ubhejane online through social media as they navigate by map only their way between Control Points through the Baviaans and Kouga, the Klein Karoo and Tsitsikamma, with the Baviaans (home to the well-known Baviaanskloof Nature Reserve, an UNESCO World Heritage Site), being the highlight of the 500km route. Wilderness Foundation Africa managed the Baviaanskloof Mega Reserve Project from 2004 to 2009 which saw the Baviaanskloof Nature Reserve grow significantly in size as well as being listed as a World Heritage Site. As part of the project WFA worked closely with the Eastern Cape Parks and Tourism Agency staff on the ground to ensure that the reserve reached its full potential both from a biodiversity conservation and tourism and recreational perspective.